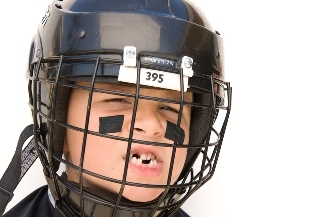 With the beginning of the spring sports season, we see an increased amount of trauma to children’s teeth. Many parents wonder what they need to do, who they need to see. Your family dentist is usually the best place to start. Most emergency rooms do not have a dentist on staff and may not have the expertise that your dentist does. The most common sports injuries are (1) fractured or chipped teeth, (2) teeth tran materially moved out of their normal position or forced out of place and (3) lacerations or cuts that may require stitches. When a tooth is fractured or chipped, the dentist will take an x-ray to make sure the nerve or root of the tooth has not been affected. When a tooth is moved out of position the blood supply to the tooth can be interrupted leading to a darkening of the tooth and eventual death of the nerve. A root canal is then required. A fractured tooth that is not bleeding or extremely painful would not require an emergency office visit. If the nerve is not affected, the dentist will proceed to repair the tooth with a tooth colored filling material. If too much tooth has been damaged, the tooth may require a crown. If the x-ray shows an injured root along with the fractured tooth, the tooth may require a root canal or even an extraction. After the root canal or extraction, the tooth will be restored to as natural a shape and color as possible. Your dentist will determine the necessary treatment. Of course, custom sports mouth guards can help eliminate almost all these types of dental injuries. Teeth that are pushed so far out of their normal position that the bite is affected need to be treated immediately by being put back into their correct position. This is true for all adult teeth but is not so for baby teeth. Baby teeth will not reattach after being severely displaced so they will need to be removed in most cases. If an adult tooth is forced out or avulsed, rinse the tooth off with water, holding the tooth by the crown and try to replace it in the socket. Do not scrub, dry or wrap the tooth; and avoid touching the root of the tooth. Ligaments attached to the root need to stay moist so the tooth may be successfully re-implanted. Placing the tooth in normal saline solution will also keep the root moist. There is a product one can purchase for just such an emergency called Save-A-Tooth. However, eye contact solution is not a good to use. If the tooth is successfully re-implanted within thirty minutes, the tooth will have a good chance of survival after a root canal is completed. Lacerations or cuts to the lip or tongue may require stitches if they are deep enough. Placing gentle pressure with a clean towel or gauze will help control the bleeding until you get to the dentist office. Your pediatric or family dentist is the best place to start with any dental emergency. Most offices have emergency contact numbers for nights and weekends and are happy to help their patients in any dental emergency.